Blossoming Gifts understand that when you want to give someone a present you want it to say just how much that person means to you. With one of their gorgeous,hand-tied bouquets, you can really make their day, and for days and days afterwards the joy of those flourishing flowers will fill their home. From cheap and cheerful bouquets to luxury ceramic orchid bowls, show your love with a wonderful present from Blossoming Gifts. They have a variety of special options for each occasion, including anniversaries, birthdays and new births. Whatever you need to say, say it with a Blossoming Gift. If you’re looking to go the extra mile, check out their amazing range of personalised gifts. Blossoming Gifts can print or engrave your message onto a variety of wonderful products, such as necklaces, picture frames and even champagne bottles! So get your special someone a certain something, and put a smile on their face. How do I use my Blossoming Gifts discount code? Subscribe to the Blossoming Gifts newsletter for updates on sales and offers! My Blossoming Gifts bouquet looks different from on the website. Flowers vary in shape, size and colour by month and season. Therefore, as flowers are like snowflakes, with no two exactly the same, Blossoming Gifts bouquets will look slightly different from those shown on the website. They will all look all the more wonderful for being unique, though. How old do I have to be to buy alcohol from Blossoming Gifts? Blossoming Gifts operate a strict policy on alcohol. Any orders containing alcohol, including hampers, are only available to those over 18 years of age. Do Blossoming Gifts have any wheat and gluten-free hampers? Blossoming Gifts have something for everyone in their amazing spread of hampers. From specific coeliac and wheat-free hampers, to their diabetic and vegan options, they really have all bases covered. Delivery options vary per product, but most bouquets have a standard £3 delivery charge. For fresh flowers, you can cancel your order up to 48 before delivery. Refunds will be dealt with on a case-by-case basis. Faulty and damaged goods must be reported within 14 days of delivery. 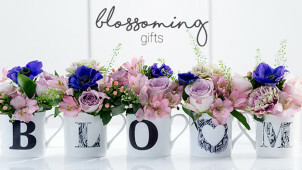 Blossoming Gifts is one of the UK’s leading online suppliers of flowers, presents and personalised gifts. When you’ve got something to say, whether it’s congratulating a new birth, celebrating an anniversary or wishing someone a happy birthday, say it with flowers. Save money with a Blossoming Gifts discount code, and let your loved one know how much they mean to you. Nothing will put a smile on their face quite like a beautiful bouquet of fresh flowers from Blossoming Gifts. Blossoming Gifts doesn’t believe in ‘machine-made bouquets’, and all of theirs are assembled by hand at their UK floristry centre, by one of their team of dedicated florists. This care and attention really shows in the finished product, and Blossoming Gifts bouquets bloom with all the beauty and glory that mother nature intended. With a spectacular array of varieties, from lilies and roses to sunflowers and chrysanthemums, Blossoming Gifts' bouquets are all the colours of the rainbow. When you want to give your loved one a gift just as special as they are, have a look at Blossoming Gifts’ range of hampers. How about the fresh fruit extravaganza of the Deluxe Supreme, with melons, mangoes and more. Get this bright, colourful fruit bouquet for less with a Blossoming Gifts voucher code. For the chocaholics, have a look at ‘The Chocolicious’, perfect for indulging that sweet tooth. For something more savoury, pick up the ‘port and stilton’ hamper. With hampers for coeliacs and diabetics, they’ve got everyone covered.